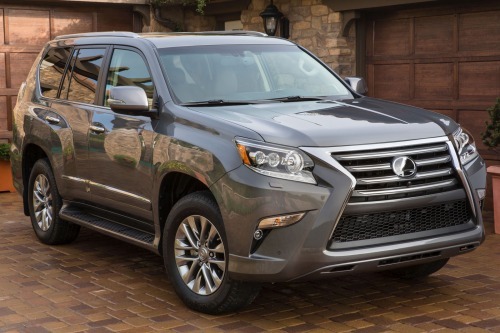 The 2014 Lexus GX receives a facelift for 2014, making it look much more like the rest of the current Lexus lineup. It now wears one of the most pronounced iterations of the brand’s ‘spindle’ grille, which is flanked by large headlamps, some very noticeable chrome, and a pair of very aggressive looking air dams in the bumper. Â From behind, it’s more conservativeâ€“and cleanerâ€“with its tall taillights and wide design. In profile, the GX is decidedly truck-like, thanks to its imposing beltline and carved-out fender. While the GX 460 is based on the brawny-looking 4Runner, it’s more of a wallflower, overall. Lexus has blended the gentle, organic, and aerodynamic styling of recent Lexus L-Finesse designs with a “machined steel bar” theme, giving it a more sculpted, solid (but simple and straightforward) look that separates it from the cars and crossovers. “Tough premium” is the way that Lexus refers to the interior, in which they’ve combined the expected chunky trim and bulkier door handles with soft, luxurious materials. The instrument-panel design is quite upright and has a horizontal-bar theme running its length–assuring a sense of toughness–although inside, the look and layout are a somewhat more upright version of other Lexus cabins. Cons include poor fuel economy-an obvious detriment, but then one doesnâ€™t opt for the large, luxury SUV because of its good fuel economy. The cargo floor is high making it somewhat difficult to load the SUV when wanting to load it up with supples. The side opening hatch, we thought, had gone the way of the original RAV. Some find it cumbersome. A lot of pros abound in the Lexus GX, and include very comfortable front seats, and driving positions that accommodate most drivers. Short drivers wonâ€™t find it as forgiving. This is a large automobile, with a powerful V8 engine pushing it along. And of course, towing capacity is appreciated for those with summer homes. Our test GX 460 luxury vehicle came equipped with one option: the Mark Levinson Premium Audio with 17 speakers, 330 watts, 7.1 channel architecture, automatic sound levelizer , single disc DVD/CD player, $1145. Something the Lexus GX has going for it is that it remains one of the few full capability luxury sport utility vehicles available. New for 2015 are the Siri Eyes-Free Mode and the Lexus Enform App Suite (adding Slacker and upgraded iHeartRadio 4.0). Siri lets you call contacts, select and play music for iTunes, get turn-by-turn navigation and Apple maps, plus a lot more. While the GX 460 has always had a truck-like look and feel, this new version is much more driver friendly. It feels smaller than it is and handles well for a large SUV. Based on the Toyota 4Runner, the GX 460 offers full-time 4-wheel-drive, and the latest in advanced dynamic control technology, making it a vehicle that can be driven on-or-off-road. In its luxury, however, the GX is a gentler version of the off-road 4Runner.Â Â One would be hard-pressed to think of a Lexus product as â€˜rugged,â€™ or practical. Case in point: Lexus refers to the LX 460â€™s interior as “tough premium.” With premium materials, the manufacturer has left no doubt that you are in a high-end SUV; luxury abounds.Â Â There are two versions of the LX: regular and Premium. Our test model was of the Premium category, equipped with just about every option you would expect and/or desire. The Lexus GX 460 easily performs family commuter duties during the week and can comfortably switch to more demanding 4×4 needs on the weekend. A 301-horsepower 4.6-liter V8 provides 329lb.ft.torque, allowing for a 6,500 lb. trailer capacity for towing. Equipped with standard Kinetic Dynamic Suspension System (KDSS) helps to reduce body lean in a top-heavy vehicle, as well as avoiding the use of stiff springs and dampers. Equipped with the latest in chassis control technology, the GX 460 comes with Downhill Assist Control, Hill-start Assist Control, Active Traction Control, Vehicle Stability Control and available Crawl Control (which modulates throttle and brake so the driver can concentrate on steering). The GX employs two suspension technologies to achieve balance of on-road smoothness and off-road ability. An Adaptive Variable Suspension system provides for better on-road stability, and moderate lean. The GXâ€™ prowess would serve Chicago drivers well during snowy months with its Crawl Control feature (mentioned above),as it helps to plow the vehicle through mud and snow. The vehicle is then able to move forward or back at one of the driver-selectable low-speed settings. We found operating the navigation system and other controls fairly intuitive. Lexusâ€™ multimedia system wants for nothing and has a screen that displays three sections at one time. Handy when you want to keep a map in sight, yet, are interested in channel surfing for the right tunes. The screen is 8-inch, has a back-up camera, HD radio, Bluetooth, automatic phone book transfer, complimentary traffic and weather data. When using the navigation system, it prompted us about locating an alternative route due to heavy traffic. When attempting to locate the closest PetSmart in the area, we came up empty-handed. The non-desirables in the GX 460 include the obvious: Poor fuel economy (who buys this vehicle for great gas mileage? ), a high cargo floor when trying to load items, and the side-opening rear hatch door. While we rather like the side-opening door, many do not, finding it more burdensome. 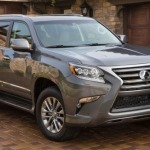 As expected, a lot of pros abound in the Lexus GX, and include very comfortable front seats, and driving positions that accommodate most drivers. Short drivers wonâ€™t find it as forgiving. This is a large automobile, with a powerful V8 engine pushing it along. And of course, towing capacity is appreciated for those with summer homes. The ever-popular Toyota RAV4 just got better for 2015. A sought after drive since its humble beginnings, this compact ute is a big favorite; particularly, among female drivers. Available in three trim levels (LE, XLE, Limited), the new 2015 Toyota RAV4 remains much the same, but with a few updates and tweeks in styling. BasedÂ Â on its redo in 2013, the RAV4 is a fairly roomy five-passenger wagon, with decent fuel economy, an improved interior dÃ©cor, but only one choice of engine: 2.5-liter, 4-cylinder; in all three trim levels. Rumor has it that in 2016, the RAV may get a turbo engine to compete with VW Tiguan, Kia Sportage, Escape and Subaru Forester. All RAVâ€™s are equipped with the same engine (2-liter 4-cylinder) and are offered in both all-wheel-drive and front-wheel-drive. Some 60 percent of buyers opt for the AWD version. For 2015, the RAV4â€™s styling doesnâ€™t vary much from the 2013 version. A few creases in the body are noticeable, and of course, the cargo liftgate-a change from the original side-hinged door. Hardly â€˜radical,â€™ the RAV4 looks much like other CUVâ€™s and has some pretty tough competition; namely, Honda CR-V, Mazda CX-5, Ford Escape and Nissan Rogue. All popular among consumers and all with good points. This year makes for a fourth-generation RAV4, one of the more spacious CUVâ€™s on the market. Rear seat room is generous however, rear seats are a tad hard.Â Â Toyota discontinued the third-row seats, which is not great loss since if you were older than five years, climbing in back was a task. The 2015 RAV4â€˜s dash remains much the same, complete with a 6.1-inch display screen where one operates climate controls, audio and nav. The quality of the interior materials is better than in the past, but still not the best. The cargo area is roomy, the ride smooth and Toyota throws in more standard features than in previous versions. We liked the interesting stitching and fabric of the seats, which by the way, are comfortable for driver and front passenger. Our test RAV4 was in the XLE version (selling the most), where trim levels are a bit upgraded. The second row of seats no longer slides making working with them (folding) a little harder. The writer is inclined to leave the second of seats down as room is needed. 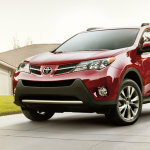 The RAV4 gets Toyotaâ€™s 2.5-liter, 4-cylinder engine in all three trim levels. Almost enough to move this small CUV, the 4-cylinder struggles at times. Maneuvering rough roads can be skittish but highway manners are better, although not sporty. Merging and passing can be done fairly confidently, but donâ€™t expect shooting out in front. Drivers can opt for Sport or Eco modes. Sport dials back power-steering assist, quickens throttle reaction, and delays upshifts.Â Â Eco mode is intended to save fuel by calibrating shift points, and dialing back on air conditioning. Most onboard technology is intuitive in the 2015 RAV4. USB-iPod and Bluetooth hands-free mobile-phone and music-streaming connectivity are standard, as are cruise control, a six-speaker CD audio system, satellite radio, and a backup camera. Toyotaâ€™s Entune option is available in different iterations on each trim level, such as the App Suite and/or voice-activated navigation with Toyotaâ€™s Entune infotainment interface. Entune connects with an onboard smartphone to access mobile apps, including Pandora and iHeartRadio and the Bing search engine. Pretty cool to have your private phone connected to the carâ€™s audio. The XLE and Limited models offer dual-zone automatic climate control, a sunroof, and specially bolstered front seats among their standard equipment. Our press RAV4 came equipped with the Entune option ($585) which includes the 6.1-inch high resolution touch screen with split screen display and integrated backup camera display, AM/FM/CD player with MP3/WMA playback capability, six speakers, Auxiliary auto jack USB 2.0-port w/iPOD connectivity, control, advanced voice recognition, hands-free phone capability, phone book access, music streaming via Bluetooth, wireless technology, Entune App Suite, HD Radio, HD predictive traffic/weather, AM/FM cache radio, SiriusXM, Gracenotes album cover. The other options on our RAV4 included mudguards $129; carpet floor mats, $225; VIP-RS3200 plus security system, #359; first aid kit, $29; interior light kit, $185..
Well, we arenâ€™t sure the new 2015 styling of the Sonata meets with approval. This writer likes the original design better; although for some, it was a little too edgy. The current restyling may be better over the long haul and feel up-to-date longer, but the former model appealed more. Our test vehicle was the 2015 Sonata Sport 2.0-Turbo, one of many iterations of this large sedan. In venetian red, our Sonata Sport Turbo was fun to drive, comfortable and accommodating. Options included the â€œUltimate Packageâ€ ($4,950) which features a big package of goodies, namely, Panoramic sunroof w/tilt and slide, high-gloss window surround, Smart cruise control with stop/start capability, lane departure warning system, forward collision warning, electronic parking brake with automatic vehicle hold, automatic high beam assist, rear parking assistance system, electroluminiescent gauges w/4.2-inch color LCD display, integrated memory system for driver seat/side mirrors, 6-way power passenger seat, ventilated front seats, heated rear seats, rear side window sunshades, navigation system with 8-inch touchscreen display, SiriusXM travel link, Infinity speakers w/subwoofer/amplifier, 400 watt. The only other option on our test Sport was carpeted floor mats ($125). The new 2015 Sonata features styling cues from its big sister the Genesis, with a modified grille and we think, not as many needed curves; No quite as handsome a vehicle. The base model is a 2.4-liter, and/or an available 1.6-liter Eco model. A hybrid is a third choice. There are some 10 iterations of the 2015 Sonata, with 2 engine options (2.0-liter Turbo, 2.4-liter including SE and limited version (2.4 L SE PZEV, 2.4-liter Sport PZEV available). Far too many from which to choose, but Hyundai is making sure to cover all bases. As the choices mount, so does the price, ranging anywhere from $21,318-$28,522. Our Sonata 2.0-liter Turbo Sport came in at over $34,000, so not a cheap date. To be sure, one could opt out of the $4,650 package however, there are some goodies in it consumers may want. The 2015 Sonata provides a little bit better supple ride. Technology is up there with the best and we found working most features fairly easy. The Navigation system was better than most and took us on a few short cuts in the city, which were appreciated. As mentioned above, we probably join the minority when high-fiving Sonataâ€™s original styling; for the very reason that it did stand out. Who says a vehicle has to be like all others just so itâ€™s able to be sustained longer (read: not as many frequent styling updates). As do other journalists, we prefer its stablemate, the Kia Optima. Just seems like more car and more its own vehicle. The 2015 Sonata is â€˜blendingâ€™ now, while other manufacturers are becoming more daring: for instance, the Ford Fusion (David Brown, Martin edition). Competitors in this class are many and also include VW Passat Sport, Mazda6 Grand Touring, Camry, Honda Accord, Chrysler 200 S. All pretty good contenders. The Sonata is equipped with a smaller turbocharger for 2015. Horsepower also drops to 245 from 274, so seconds are lost when in the 0-60 mph area. The base Sonata gets a 2.4-liter four-cylinder with 185 horse, and opting for a Eco version, the 1.6-liter is in charge. The hybrid version remains unchanged until 2016. The Sonata Sport gets the most drastic styling changes; a rather bland, run-of-the-mill, look like everyone else look. The rear spoiler is less than inspiring and quite frankly, not needed. In the interest of adding â€˜sportiness,â€™ we suppose. Registering a whine upon cold start, our Sport test vehicle otherwise performed flawlessly. On a long drive into the city, the Sonata proved a real champ, running in/out of tons of traffic. Then on our way home, in unfamiliar territory, we cranked up the nav system and it took us the shortest distance from A to B, around road work. Hyundaiâ€™s interior has been updated and improved; much more competitive and plush with better materials. Knobs are easily operated, the technology very intuitive and wind noise at minimum or none. We still marvel at how easily these vehicles operate. There is some engine and turbo noise, but not overbearing. Visibility is good and rear seat room plenty for 2-3 passengers. We drove utilizing the paddle shifters for a day and found it more enjoyable than anticipated. The manual shifting was also fun, especially when maneuvering in/out of traffic. This is such an easy car to drive, it might be easy to get into trouble: not because you are blowing all the other cars off the road. Rather, that it is a fairly nimble car and easy to handle. Most purists complain about the Korean vehicles numb steering. Not a BMW or real â€˜performance,â€™ vehicle just tells us not to expect as much. We kind of like the ease of driving these vehicles. So nice for a change not to have to â€˜workâ€™ at performing. Which leads us to comment on why they named this Sonata verision a â€œSport.â€ Itâ€™s a large, comfortable sedan. We did find the braking a tad touchy and had to become accustomed to it. Sometimes when in/out of several vehicles, one does have to adjust habits. Nevertheless, this writer remains biased to the Korean vehicles. We like just about every offering in the lineup. Sportiness or not. 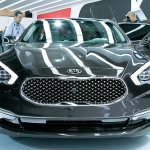 All new for 2015, the Kia K900 is the first V8 for Kia, is available in two versions: Premium ($54,500) and Luxury($59,900), and is sure to create a following, if Kia can get customers in the door looking for a full-size luxury sedan. Reasonably priced for all its standard equipment, the K900 is a dream to drive. Some comparisons have been made with the Ford Fusion (? ), and more likely, Mercedes Benz C-class and Hyundai Genesis sedans. 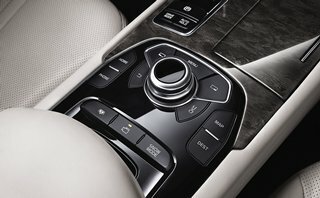 However, the K900’s central competition of course, includes the Lexus LS460, Audi A8, Hyundai Equus and BMW 7-Series. 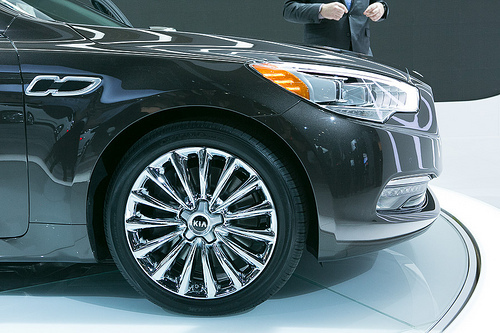 Belonging toÂ the â€˜exclusiveâ€™ luxury sedan group requires enough income to indulge in such special wheels. The introduction of the new Kia K900, an additional offering in this elite group, will be tested: not only for brand recognition but for a lower price tag than most. 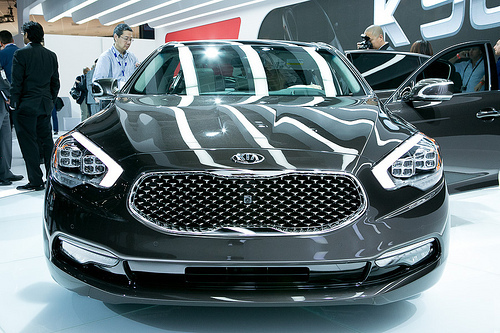 The K900 is a beautiful automobile, complete with all youâ€™d expect in a vehicle surpassing the $60,000 price range. 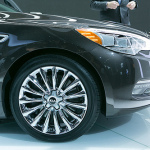 Kiaâ€™s largest sedan thus far, the K900 offers a roomy, plush interior to match its elongated exterior. It is a handsome car, with up-to-date styling cues. The jury is out whether/not the Kia Cadenza-style front grille is a keeper. Drivers better be technologically savvy as the K900â€™s electronics take a little expertise. We became, at times, a tad frustrated trying to navigate the audio. You certainly cannot-and should not-attempt this while driving. As expected, the new K900 is fully loaded, yet at a price that falls under the European luxury sedans, by quite a few dollars. Savings on what is standard equipment on the K900 gives the Kia K900 an advantage, of sorts. Kiaâ€™s warranty is also a plus, which includes three years of free scheduled maintenance. In spite of all its â€˜pros,â€™ the K900 has a few â€˜cons;â€™ namely, the switchgear. At first drive, this writer wasnâ€™t at all sure how to shift into reverse, much less drive. Although a simple fix (depressing the button), movedÂ the car into gear. Still,Â it was frustrating. The K900 is not available in all-wheel-drive, either; possibly another limitation. Those accustomed to European and Japanese quality interiors may be a little disappointed in the K900â€™s less-than quality inside the cabin. Likewise, the purists would probably vote a â€˜no,â€™ on driving experience. But then, who can compete with the likes of BMW or Mercedes-Benz; both manufacturers with years in the business. We also experienced a fair amount of frustration attempting to make sense of the infotainment interface, and at one sitting, could not get back to the audio screen; rather, the display continued to prompt this writer for a language choice. Complicated and somewhat unintuitive (say, compared to Lexus), the K900s system is finicky. For those tall drivers, limited front seat headroom might be a problem. However, the Kia K900 is simply too good to pass up; this writer feeling quite comfortable in the big sedan. For regular customers of Audi, BMW and/or Lexus, it might be a stretch to ask them to cross over, but weâ€™d suggest at least a test drive. Get over the fact that it is a â€œKia,â€ You might be surprised-and pleased. Standard features for the K900 include 18-inch alloy wheels, adaptive xenon headlights, LED foglights, power-folding and auto-dimming mirrors, a power trunk lid, automatic wipers, front and rear parking sensors and keyless ignition and entry. Interior features include the usual: tri-zone automatic climate control, cruise, heated rear seating, driver memory settings, heated/ventilated front seats, leather, tilt-telescoping steering wheel, Bluetooth, 9.2-inch display screen, nav, front/rearview cameras, 17-speaker Lexicon surround-sound audio system with AM/FM/XMSirius/CD, iPod/USB interface, HD radio. Kiaâ€™s Uvo eServices include emergency assistance and teen-oriented monitoring features such as curfew, speed and geo-fencing. Our test K900 came equipped with one option: the VIP package which includes Advanced Smart Cruise, Advanced Vehicle Safety Management, Power door latches, 12.3-inch full LCD TFT IP, Heads-up display, Surround view monitor, driverâ€™s seat cushion extension, front seat power headrests, power reclining rear seats, ventilated rear outboard seats, Lateral adjusting rear headrests and rear seat lumbar support ($6000). An expensive option and really, the most of what youâ€™d need might be the vehicle safety management system. The VIP package also adds a 360-degree top-down camera system and a frontal collision warning system that tightens the seatbelts and primes the brakes for maximum stopping power if a collision is imminent. Standard safety features for the 2015 Kia K900 include antilock disc brakes, traction and stability control, front and rear seat side airbags, full-length side curtain airbags, front and rearview cameras, and. The V8-powered K900 models also have a blind-spot monitoring system, rear cross-traffic alert and a lane departure warning system. Heated steering wheel, credit-card size smart key, and upgraded leather are standard on the V8 version of the K900. The K900â€™s wood interior trim is real, which in some ways seems dated, however, a staple of luxury full-size sedans. The K900 seems to have many buttons scattered so the learning curve may be a little higher than some. Kia doesnâ€™t offer a rear entertainment system, or audio controls for rear passengers. Perhaps one of the ways to keep costs down. Although other journalists may disagree, we found Kiaâ€™s V8 with enough power to pull this good size sedan. Some would argue the â€˜rushâ€™ is missing, and the power output not competitive with other full-size sedans. This writer doesnâ€™t feel cheated when pushing the V8; it just feels pleasant to have that power most cars donâ€™tâ€™ have today, with a V6 or 4-cylinder. Road noise is little, if any and the ride is smooth and comfortable. We didnâ€™t detect any wind noise. The K900 does not offer different suspensions so the ride remains the same. The car feels heavy, particularly around turns; but then it is a large vehicle. We enjoyed our week in the new K900 and find it especially attractive. Partial to the Kia vehicles, this writer would recommend giving the K900 a once over. EPA fuel Economy: 15/23 mpg. 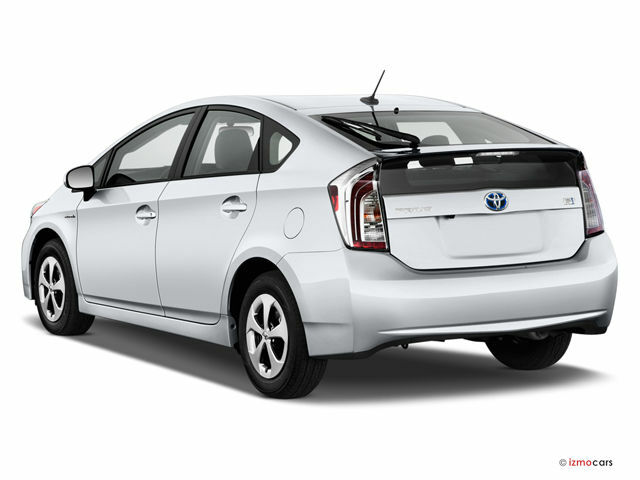 Easily recognizable, the 2014 Toyota Prius Hybrid HB looks much as it did in 2004. Now in its eleventh year, the Prius is by far the best-selling hybrid on the market. What is new in the last couple of years are additions to the family; Prius V, Prius C (subcompact, wagon, plug-in hybrid). However, most sales go to the classic hatchback 5-door model. Often referred to as a â€˜womanâ€™s car,â€™ the Prius liftback accounts for about one in five cars in and around Chicagoâ€™s metropolitan area. Its sloping shape helps fuel economy, and its two-part split rear window and domed profile give it away. It is hard to tell the difference between the Prius plug-in and the hybrid-only model, except for the larger battery pack, rechargeable on wall currents. Trim is somewhat different and of course, the charge-port door on the right rear fender gives it away. The standard Prius Plug-In Hybrid uses a 1.3-kilowatt-hour nickel metal hybrid battery pack, while the Prius HB uses a 4.3-kilowatt lithium-ion pack that gives it 11 miles of electric range on the EPA test. Only six miles of that range is continuous because the engine switches on at least once to power the car even though there is energy left in the pack. The newer Prius C and Prius V are much better to look at, more stylish and perhaps a tad more practical. The C subcompact and the V wagon are rated at just about 50 mpg combined (the wagon, closer to 42 mpg). Our test Prius came well-equipped, the HB 5, top of the line in this model. Upon entering the car, we were addressed by a speaker warning of inclement weather. Surprised us. The number of options on our test Prius HB Five brought the car up to $37,267. Almost $7,500 worth of options!! The Prius cabin hasnâ€™t changed dramatically and is less than luxurious (even at the $37,000 price tag), but it is spacious, front and rear. 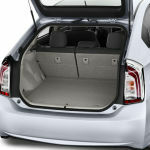 Four adults can comfortably fit, and a fifth could be squeezed in, putting the Prius HB in the midsize car category. The front seats are a tad thin, not much padding and not real comfortable , although serviceable. The Prius power plant includes a 1.8-liter four-cylinder engine and a pair of electric motor-generators, the Hybrid Synergy Drive powertrain, and 134 horsepower. The car is powered solely on electricity up to 30 mph, and electric torque supplements torque from the engine. The battery recharges during regeneration braking or engine overrun. With more experience building hybrids than any other automotive manufacturer, Toyota generally gets it right. Toyotaâ€™s ability to blend the regenerative braking with the conventional friction brakes is excellent, however, it does take some getting used to. At first, the brakes seem jerky but once youâ€™re in the car for awhile, you understand the feel of hybrid braking. Driving a Prius for the first time is a different experience. Once driverâ€™s become accustomed to how it moves forward-at times without anything the driver does-and how the hybrid system continuously adjusts the power sources, it feels well, kind of interesting. It is a unique experience in some ways from driving a conventional automobile. Donâ€™t expect to have much feel when handling the steering wheel; itâ€™s rather numb. The car seems to just drive itself, navigating all manner of roads, traffic and speeds. The driver is just a passenger, or so it sometimes seems. Safety equipment abounds, as expected. The Prius has seven airbags, available adaptive cruise, rearview camera, lane-departure warning system, Intelligent Parking Assist and a Safety Connect system that notifies help in the event of an accident. The Prius HB is rated IIHS Top Safety Pick. Anti-lock brakes, tire-pressure monitor, Elect Brake Force Distribution, side curtain airbags and driverâ€™s knee airbag, VSC and TRAC all ensure a very safe vehicle. Four trim levels are available in the Prius HB hybrid: Two, Three, Four and Five. Our test vehicle, a Five included just about most amenities. Touch Tracer controls situated on the steering wheel assist drivers to navigate the menus on the display without taking their hands off the wheel. 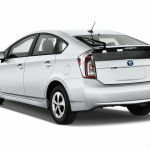 The Prius Four and Five begin at $30,000, inching up as options are added. Little has changed on the 2014 Prius HB, other than a few modifications to the frontend, and the addition of LED daytime running lights. The display of information is now loaded with more information, on a somewhat small screen in the center of the IP, behind the steering wheel. There are so many icons, graphs, numbers that one can become confused. Unique to the Prius, however, are its shift knob and â€˜flying buttressâ€™ center console that elongates from the dash. Hard plastic makes up the cabin, and the seating isnâ€™t the most comfortable on long trips. The cabin is spacious, making for a fair amount of elbow room. However, the interior of the Prius HB seems dated and low budget. Especially with a price tag hovering just over $37,000, one expects a little extra. Technology is more 21st century and includes a Remote Touch controller to control icons on the nav screen. Fuel economy on the 2014 Toyota Prius HB has increased. The EPA rates gas mileage for the hatchback at 51/49 mpg., giving it a combined 50 mpg. Depending on how someone drives the car, and where, the gas mileage can be in the high 30s from the mid-or-upper 40s. Under most driving, the car is very quiet, you barely know itâ€™s running. Noise and vibration are minimal. For everyday drives, the Prius is excellent; but donâ€™t expect â€˜performance,â€™ handling or anything that might require real driving skills. The Prius provides an â€˜Ecoâ€™ mode and an â€˜EVâ€™ mode that allows the car to run on energy from the battery pack until its 1-mile or so of low-speed electric range is gone. If youâ€™ve got a lead foot, mileage will suffer and youâ€™ll switch into gasoline mode. When driving from Chicago to Vermont last year, the Prius averaged around 48 mpg., and that is not a hard and fast figure. We estimated a guess and utilized the gas engine a good part of the driving. Even so, it was practical. And the amount we hauled inside was impressive. Driverâ€™s can adjust their height, making this a good size vehicle for most size drivers, although tall people may be cramped for knee room. Highway driving is quiet and comfortable as the car just hums along. This isnâ€™t a vehicle you want to drive hard; rather, it is best for around town if one wants to enjoy its positive attributes. Pricing remains the same for 2014; the two begins at $24,200; the Three, $26,765; Four, $28,435 and Five, $30,005. Delivery is $810. Prices have risen since 2014 since the introduction of the Prius C which is now the least expensive Prius model, starting at just under $20,000. The Prius HB hybrid plug-in had its pricing reduced between $2000-$4,600. 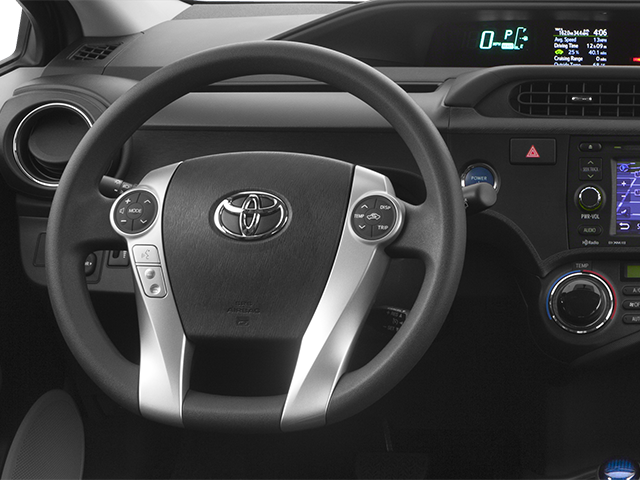 All Prius models have standard power windows/mirrors, cruise, AM/FM/XM/CD audio, Bluetooth, a 6.1-inch display screen, iPod and USB connectivity. Moving into the Prius Three gets you the backup camera, navigation, and an upgraded audio. 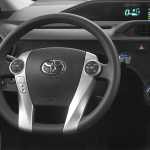 Toyotaâ€™s Entune multimedia system is also built in. Entune enables applications of Bing and Pandora. If you just have to have such options as heated seats, or leather, you must opt for at least the Prius Four. 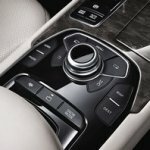 The Five adds LED lamps, larger 17-inch alloy wheels, automatic lights, 8-way power adjustable driversâ€™ seat with power lumbar support and optional split-screen capability in the 7-inch nav display. 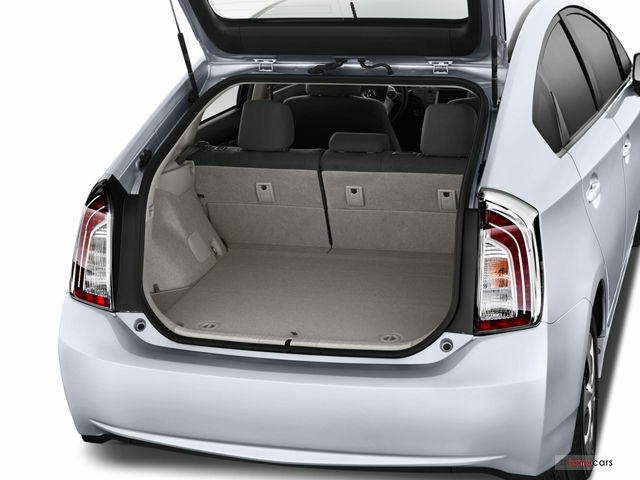 Our test Prius Five came equipped with the 17-inch split alloy wheels ($1,599); first aid kit ($29); illuminated door sills ($279) and carpet floor mats/trunk mat ($225). In addition, it also came with the optional Advanced Technology Package at a whopping $4,320. For those who must have a solar roof, it comes in a package which uses photovoltaic cells in a glass panel to generate electric current. Fans draw the heat out of the cabin while the car is parked. Another option includes remote starting for the A/C. Having driven the Prius hatchback several times in the last two years, we found this time to be the most enjoyable, leaning closer, perhaps, to being a convert. Although it is hard to imagine driving anything but a car with the conventional engine-and power-the Prius is a satisfactory daily driver. Warranty: 3 yr./36,000-mile basic; ;unlimited corrosion; 5 yr./60,000-mile drivetrain; 8 yr./100,00-mile hybrid components;; 2 yr./25,000-mile maintenance; 2 yr./25,000-mile roadsid assistance.